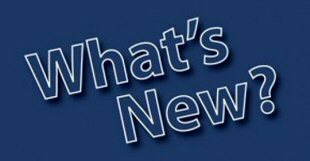 It’s been yonks since The Man Bird, Mummy Bird and I all went to an Italian restaurant to eat, so we were all looking forward to seeing what Cucina in Derby had to offer. We played it safe and booked ahead as there was originally going to be four of us dining all together, but unfortunately Chickadee didn’t make it, so just the three of us walked through the door. Mediterranean culture is renowned for being family friendly and there was a large family group, including small children, already sat at a table nibbling away at a selection of antipasti dishes. Some other folks were sat at the bar, sipping at coffees and beers whilst they chatted, and there were also some couples in to dine early doors. Instead of music, the thrum of conversation and laughter provided the background ambience. 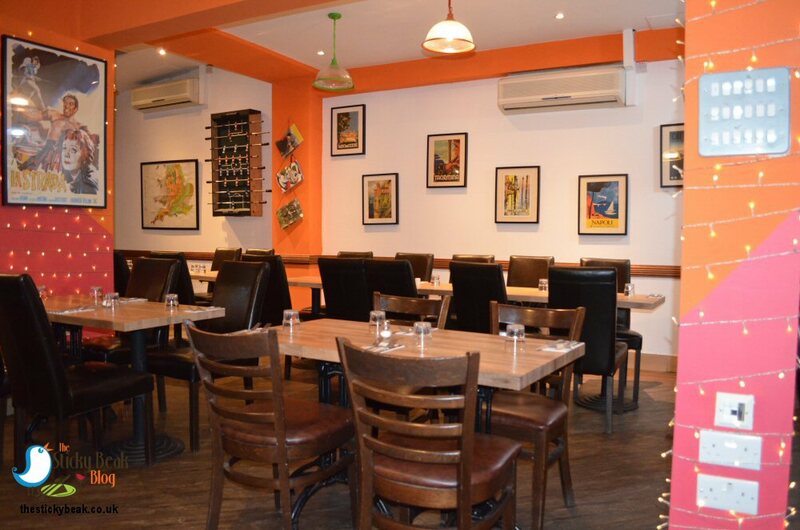 Cucina is decorated in lovely warm sunny colours reminiscent of the warmer Mediterranean climes, and pieces of colourful sculpture, advertising boards and artwork adorn the various walls and shelves. At the back of the venue is the lovely large open kitchen, and the smells coming from it were incredible – we couldn’t wait to tuck in ourselves! The staff themselves are dapperly dressed as you expect from the innate sense of style that Italians have, and they were all very friendly and relaxed in their dealings with customers. Yep, I was definitely getting the relaxed vibe of Cucina, and liking it very much. Having been and stuffed ourselves the night before, we all decided to skip the Antipasti section, tempting as it was, and just go for starters. 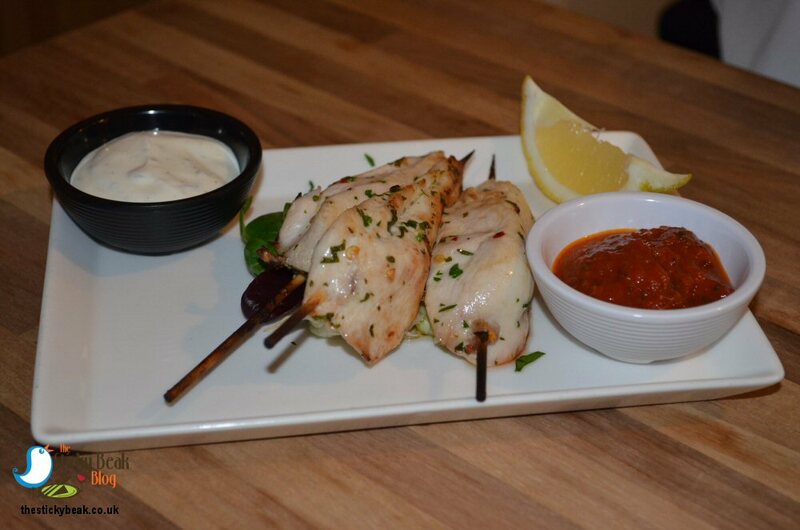 I fancied the grilled Marinated Chicken Skewers with Tangy Tomato- and Sicilian Yoghurt-dips, His Nibs had Calamari with Aioli, and Mummy Bird wanted the Funghi Bruschetta (Wild Mushrooms, Garlic and Cream on toasted Ciabatta). We ordered what turned out to be a very cheeky little white wine called Grillo; crisp, clean and fresh on the palate, and not badly priced at all at just under £19 for the bottle. The Man Bird was in the mood for a lager, so he had a pint of Birra Moretti. starter. I was loving the tangy Tomato dip, it bounced around on my palate like Tigger in spring, and the herbed Sicilian Yoghurt dip was equally delicious in its simplicity. 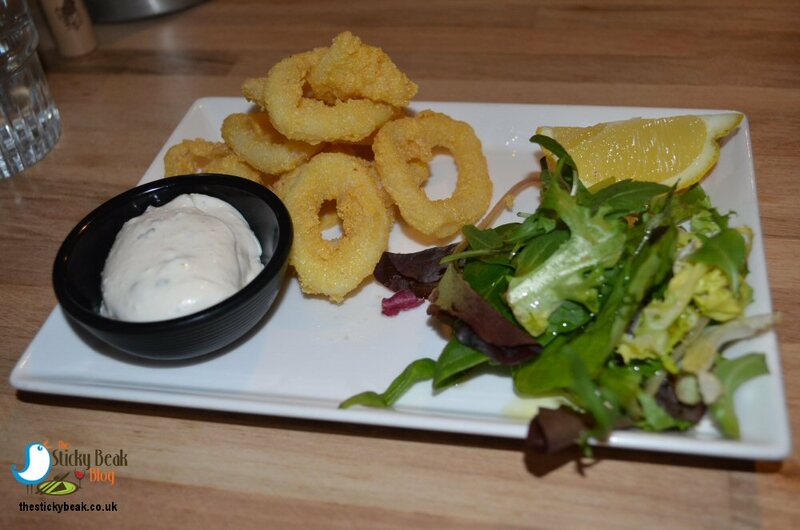 The batter on His Nibs’ Squid rings was just superb – really light and crunchy, and again delicately seasoned. Chef at Cucina clearly knows his seafood; the Squid was cooked to perfection, making it beautifully soft in the mouth with not a trace of rubberyness in sight. A good Aioli should announce its Garlic content clearly, and the one at Cucina in Derby does it wonderfully well. I should point out though that the Garlic was nicely rounded in character so it wasn’t at all harsh in the mouth or burning the tongue. My Mummy Bird was digging into her bruschetta starter with a fair amount of gusto, a huge smile reaching from corner-to-corner on her face. 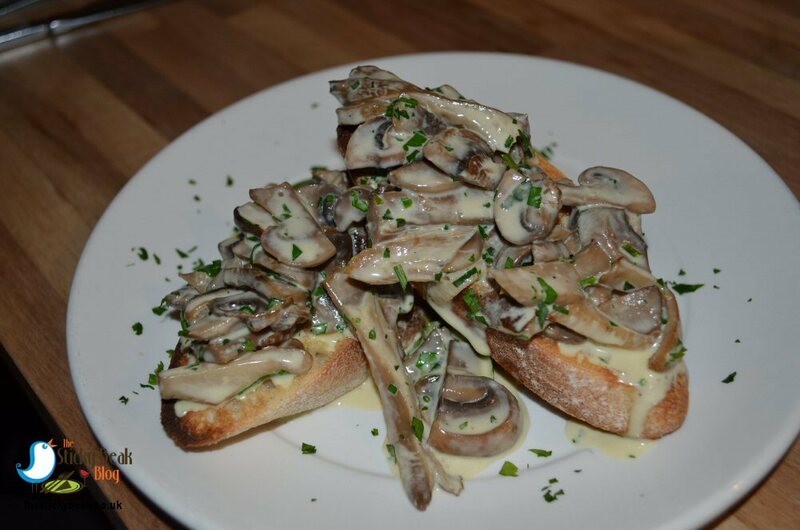 There was a very generous amount of creamy, garlicky sliced Mushrooms to enjoy, and the flavour of them was divine; their earthiness partnered the garlic well and the addition of cream bound it all together harmoniously. Let’s just say that her plate was the squeakiest of them all in terms of cleanliness! For mains we’d chosen Lamb, Pork, and Chicken (His Nibs, me, and Mummy Bird respectively).We also ordered a trio of side dishes: Cauliflower Cheese, Spicy Four Season Chips, and a House Salad –it’s always tricky when you go somewhere new, you don’t know how generous they are! 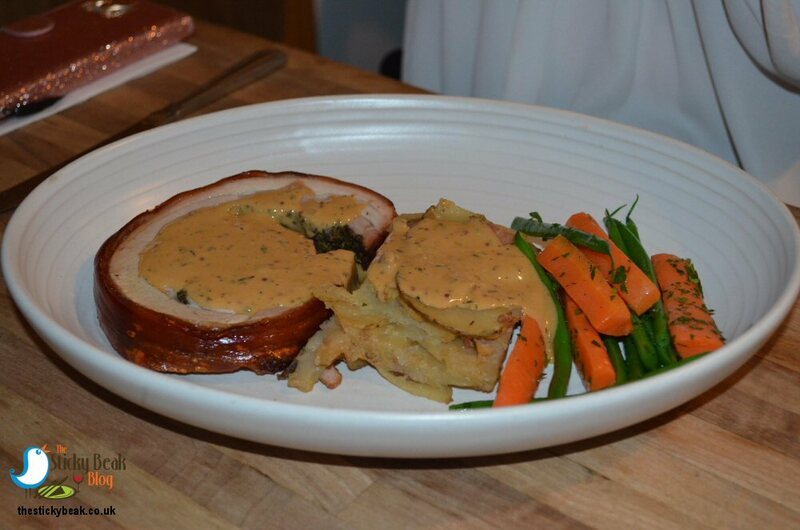 My dish was the rolled belly and loin of Pork that was filled with herbs and Apple, served with Potato Terrine, jus, and seasonal vegetables. The only thing that could possibly have made it perfect was if the skin had been scored to make crackling, other than it was sensational! The meat was gloriously sweet and moist, not dried out and chewy as people always fear will happen with Pork, and the fruit and herb elements were nicely balanced. Both the Carrot Batons and trimmed Green Beans were still just-firm to the bite (perfect) and the jus complimented everything excellently. Slices of Potatoes had been layered and baked to produce the nicely firm terrine and it completed the meal very nicely. 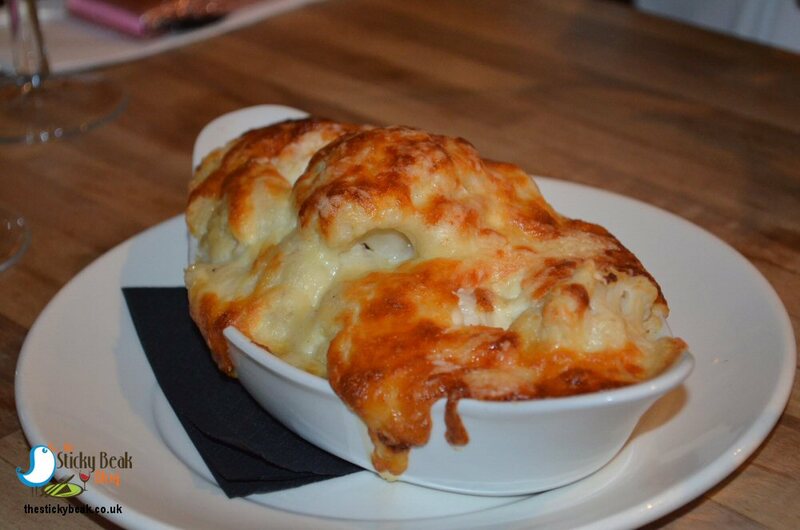 As I was the one who’d banged on about the Cauliflower Cheese, I felt it only right that I should be the one to try it first! The aroma as I broke through the thick baked Cheese Crust was enough to make me salivate, and the cloud of steam told me that it was piping hot. There’s nothing particularly hard in making this simple dish, but it has an infinite capacity to lift the spirits when done well; the base white sauce that cocooned the Cauliflower was comforting in the mouth, lingering as it did on the cheeks and tongue. A good strong cheese imparted its character to this otherwise fairly unassuming vegetable accompaniment and we all tried it and agreed that this was sublime. Mummy Bird’s Chicken was a master class in the flavours and textures of Italian cuisine, and her taste buds were doing a samba of joy! The Chicken Supreme was smothered in a fragrant Putanesca sauce, bursting with Black Olives, Tomatoes, Onions and garlic; the light spiciness was perfect, not too hot at all, but definitely punchy. 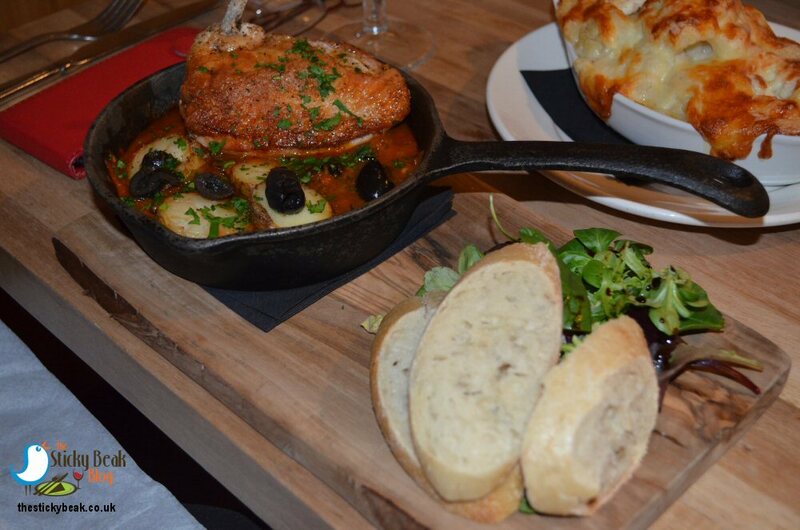 Although this dish does come with Ciabatta and a side salad, Mummy ordered salad as her side dish – she’s a fully paid up, card carrying (and proud!) member of the salad appreciation society. 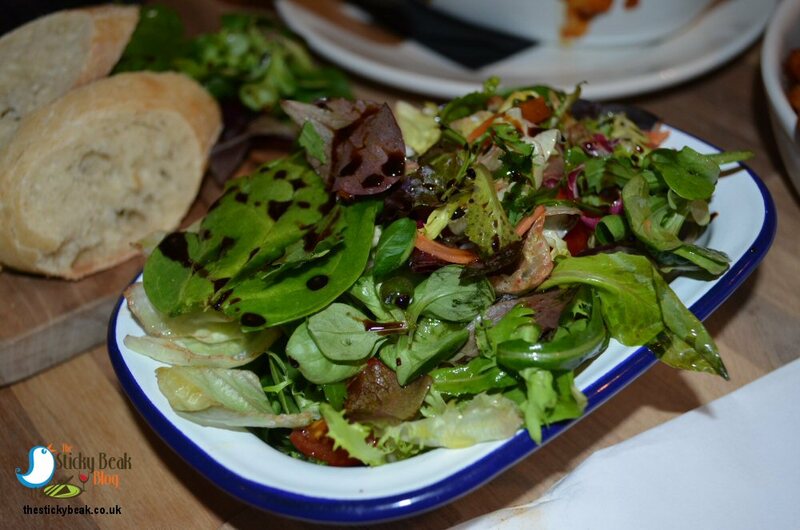 The house salad is chocka with mixed leaves, juicy Tomatoes, Olives, and Onions, all dressed in Balsamic dressing. Yummy. 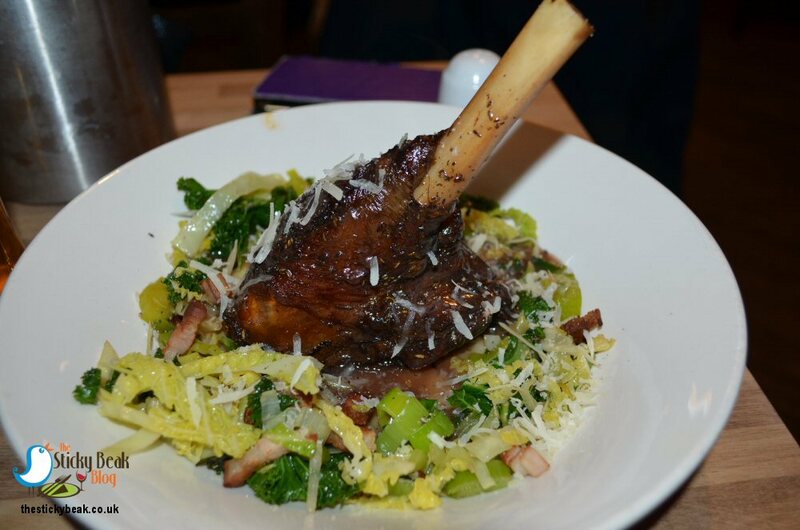 The Lamb Shank that The Man had opted for was wonderfully deep in flavour and literally fell off the bone when the knife went near it! Thanks to it being braised slowly, the fibres of the meat remained intact, giving it a satisfying quality in the mouth when chewed. A deep bed of Caramelised Onion mash tasted lightly smoky and sweet, and provided a lovely backdrop for the verdancy of the wilted winter Greens. Pancetta cubes added their rich notes to the dish, and the bright Rosemary and Thyme jus lifted things superbly on the palate. 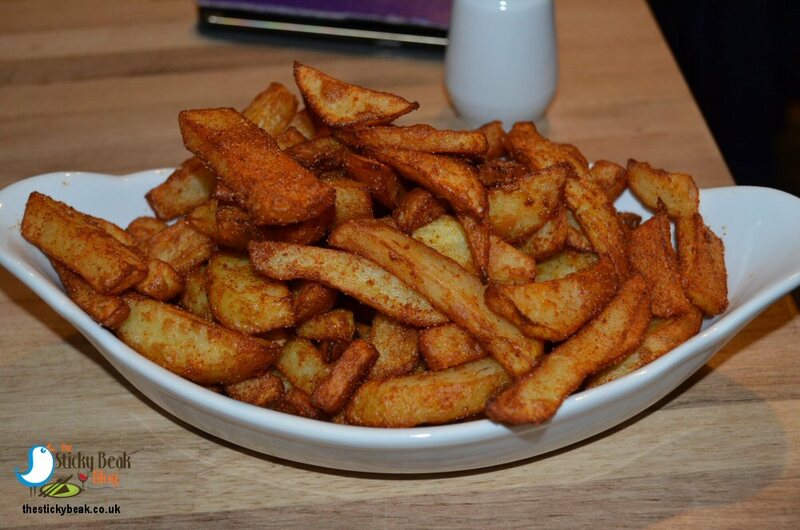 Spice lovers rejoice; Cucina do some marvellously vibrant Fries that certainly aren’t shrinking violets in the spice ratings! His Nibs was well impressed by the tingle that the Spicy Four Seasons fries give in the mouth . The fries themselves were lovely in terms of taste and texture, so even if you order the plain or Garlic, Rosemary and Pecorino varieties you’ll still get a great tasting chip! Our servers had all been so attentive throughout the evening; topping up glasses of wine and water, checking that our food was to our liking, and asking if we needed anything else. In fact, part of Cucina’s charm is the friendliness of the staff; they make you feel like friends rather than customers, sharing stories and jokes with you. There was just me in the market for dessert; we were all stuffed, but there is no possible scenario in which I pass up the chance to have Tiramisu! 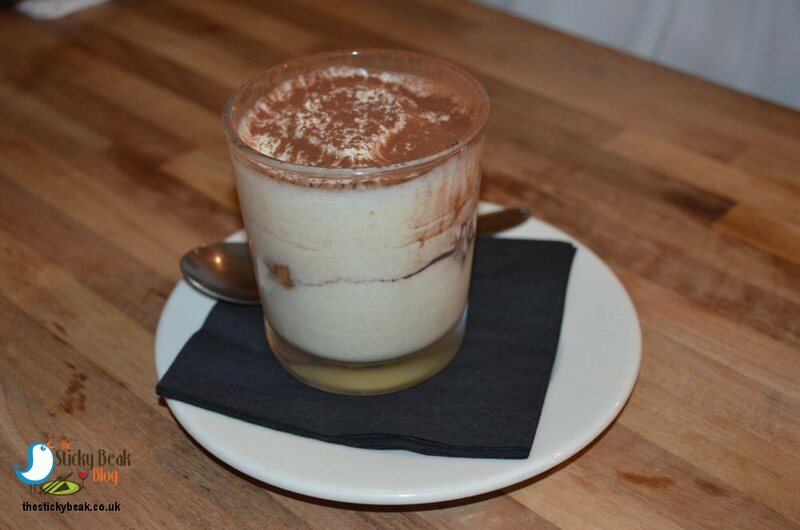 Usually, Tiramisu is made in a large dish and served in portions akin to Lasagne but yet again, Cucina like to do it their way; their dessert is made in an individual glass. All the key components are there: cream, coffee, lady fingers, chocolate, it’s just that a bit of flair has been used to put it all together. His Nibs and I had our usual black coffees to conclude the meal, leaving Mummy Bird to take one for the team and finish off the last of the wine! The evening had passed in a blur of family love, good company and conversation, and great food – what more could you want? 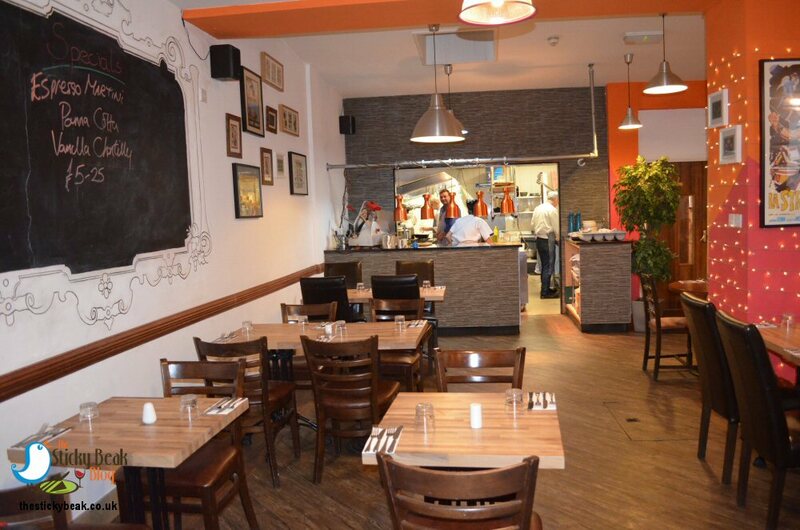 Cucina delivers on all fronts for those wanting a good night out; whether for drinks and antipasti after work, or for an evening meal in the company of those you choose to be with. Hot Wings happily given here .